Feel like you're living in a circus? Our kids clown costumes will get smiles from everyone this Halloween. We have a colorful variety of boys and girls clown costumes that include dresses and jumpsuits. You can get clown costumes for all of your kids with sizes that range from infant to children's large! 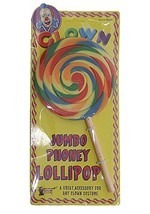 Use makeup and our funny clown accessories to give each of your clowns a personalized Halloween costume.